This week at the Ball, we welcome a Deb alum — the wonderful Mia King, who is a graduate of the first class! 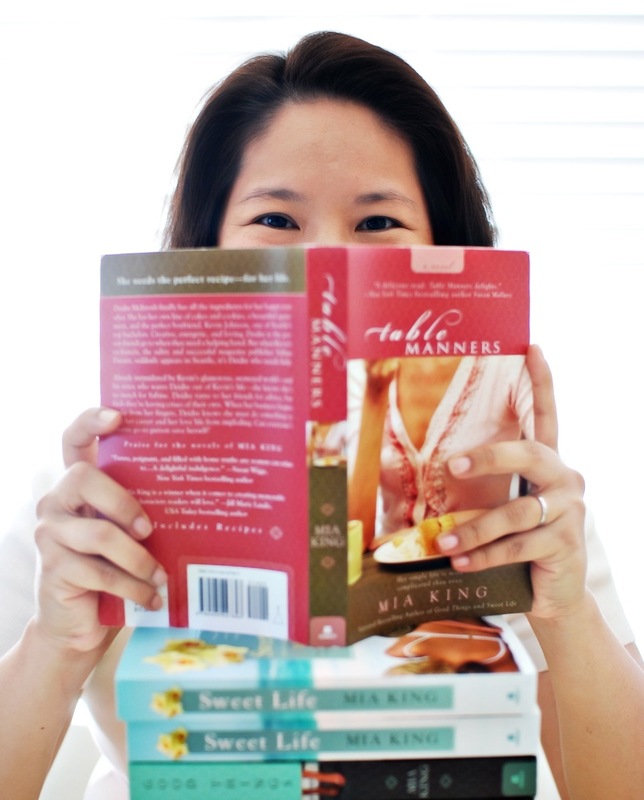 Mia King is the national bestselling author of seven novels, including three written under the name Darien Gee. Her books have been translated into 14 languages and are selections of the Doubleday, Literary Guild, Rhapsody and Book of the Month Club book clubs. Mia lives with her family in Hawaii. (And we’re SO totally jealous.) She is currently at work on her next novel, FOUND OBJECTS. And in her latest, FAMILY ROOM, after seven years, she revisits the memorable Deirdre McIntosh, the protagonist from her bestselling novel GOOD THINGS. Deidre is a woman with it all…a successful business, a doting fiancé, a baby on the way. But business is getting busier, Kevin is always on the road and Deidre’s future mother-in-law has hijacked the wedding plans. To make matters worse, Kevin’s sullen goddaughter, Claire, has been expelled from boarding school and has ended up in Deidre’s care, a temporary arrangement that seems more permanent by the day. Claire Phillips doesn’t want to be in Seattle. It’s bad enough that her own parents are too busy with their lives to care about hers, but being stuck with Deidre is like a prison sentence. Deidre works, cooks, cleans and crafts…the woman is obviously nuts. Claire knows it’s just a matter of time before she’s enrolled in another boarding school, out of sight and mind once again, and despite her godfather’s promises that things will get better, Claire is doubtful that anything will change. Why should it? But when a woman appears on Deidre’s doorstep, both Deidre and Claire find themselves faced with the ultimate question: what is family, and what lengths would you go to care for those you love? This week, Mia stopped by the Ball to share some of the twists and turns of her writing and publishing journey. And we’re so excited to welcome her back! It’s so great to be back at the Debutante Ball–thank you for inviting me back! I launched my literary career here at the Ball with GOOD THINGS and had no idea what would be in store for me over the next seven years. I wanted to share a bit of what my journey’s been like. GOOD THINGS had done well and was a national bestseller. But my next two novels, SWEET LIFE and TABLE MANNERS, brought in lower sales numbers. In publishing lingo, this is called “trending down” and it is not a good thing. My agent at the time was doubtful she could sell a fourth book because publishers would’t want to take a chance on an author whose numbers were falling rather than rising. She didn’t say it was over, just that it would be very, very difficult to sell my work again. I spent a few weeks brooding and feeling like mud, and then I decided I’d had enough of that. I trusted myself as a writer. I set to work writing my next book with the hopes that it would be a way for me to “level up” my career. Inspiration came knocking and five weeks later, thanks to the support of my husband Darrin who juggled our three young kids, our home life, and his own business, I had a first draft of FRIENDSHIP BREAD. I ended up with a new agent and the novel sold at auction to Random House. They thought it was too different from my first three books so I published it under my real name, Darien Gee. Over the next two years I wrote one more novel, THE AVALON LADIES SCRAPBOOKING SOCIETY, and a holiday novella, AN AVALON CHRISTMAS, which I indie published. In the meantime, Mia King readers kept asking when they’d get another book. 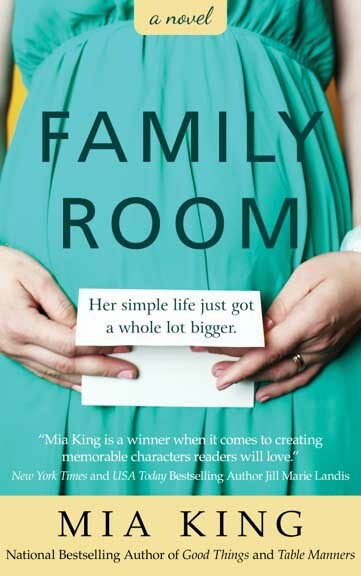 I’d started writing FAMILY ROOM back in 2010 — I had a clear sense of what was going to happen and I was especially fond of Claire, Kevin’s difficult 10 year old goddaughter, who has a point of view in this book. I told readers the book was “coming soon!” for almost four year but every time I thought I was done, something else came up and I’d revise it again. It was getting to the point where I thought I might not ever get it done. But when I did my last read through before the manuscript went into production, I could feel that the book –and Deidre’s story — had come full circle. Deidre, along with many of the other characters, had gone through a journey just as I had these past few years, and by the end of FAMILY ROOM they are all exactly where they need to be. I feel that same way about my life. Remember how I said “trending down” wasn’t a good thing? Well, for me it turned out to be a great thing. It strengthened me as a writer and challenged me. It tested my beliefs about myself and what other people believed about me or my career. I learned to trust myself and to ask the question, “How do I feel about this? What do I believe?” It opened the door to something better but most importantly it gave me clarity about what being a writer means to me. I’ll be writing as Mia, and I’ll be writing as Darien. I’ll traditionally publish and I’ll indie publish. But the most important this is this: I’ll always write books, and I’ll always tell stories. Advice to Writers: Let go. Do what you can, write your heart out, have fun, then let it go. Advice to Readers: Stay open. To new writers, new books, new ways of thinking, to happy surprises. Seek literature that helps you feel good, that puts a smile on your face, that makes you think. There are lots of ways to engage in the world in which we live, and books are one of them. What’s your next big thing? The next Mia King book is called FOUND OBJECTS and it’s about a young woman, Emma Hunter, who inherits a failed art gallery from a father she never knew. GIVEAWAY: Mia will be giving away a bundle of books — sorry, US or Canada only — including GOOD THINGS (paperback or Kindle), TABLE MANNERS (paperback or Kindle), and FAMILY ROOM (Kindle). Comment on this post by Noon (EST) on Friday, November 28 to enter to win. Follow The Debutante Ball on Facebook and Twitter for extra entries—just mention that you did so in your comments. We’ll choose and contact the winner on Friday. Good luck! Find Mia on the web here, or catch up with her on Facebook or Twitter! Good for you for persevering and congratulations. Your books sound wonderful. I follow on twitter and facebook. i follow you on Facebook & twitter! Muitingting! Hope to get to read the books :)! Oh man, I hope i win! I love Mia’s books.